Mr. Pete sees lots of people throughout the week as he travels to schools picking up musical instruments and dropping off repairs. Many of those people know that he is a church-going Catholic. One of his customers has started bringing him statues of saints and of the Blessed Mother that he finds at sales or antique stores. 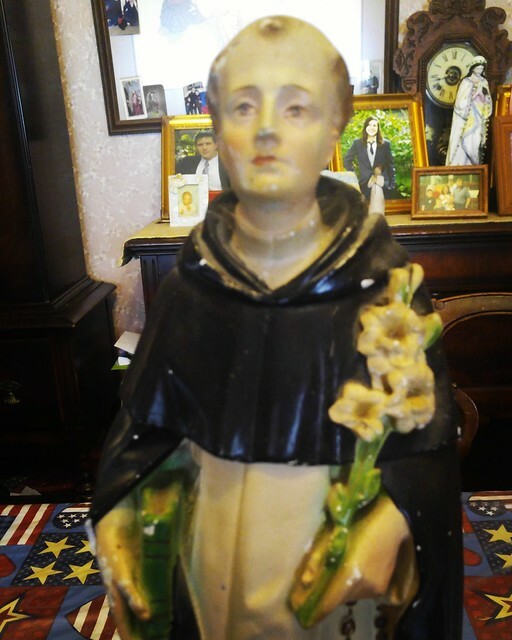 This neat statue of St. Dominic is one of those finds! We aren't always home for the feast day of this saint, but we are this year and so I have him standing patiently in the middle of the table to celebrate his feast day! "Our most holy Father Saint Dominic, confessor and founder of the Order of Friars Preachers. He was most illustrious, being distinguished by nobility of birth, sanctity and learning. Until death he preserved without stain his virginity and by the singular grace of his merits he raised three persons from the dead. By his preaching he curbed heresies and established many persons in a religious and godly manner of life. On August 6, his soul soared to heaven, there to receive a reward commensurate with his extraordinary works. His feast, however, is celebrated on this day [8 August], by an ordinance of Pope Paul VI". How to Pray Better with St. Dominic! His Feast Day was moved a lot!